With April Fool’s day just passing by, I want to bring attention to perhaps the quirkiest comic creator from the WECA period, Tedd Steele. 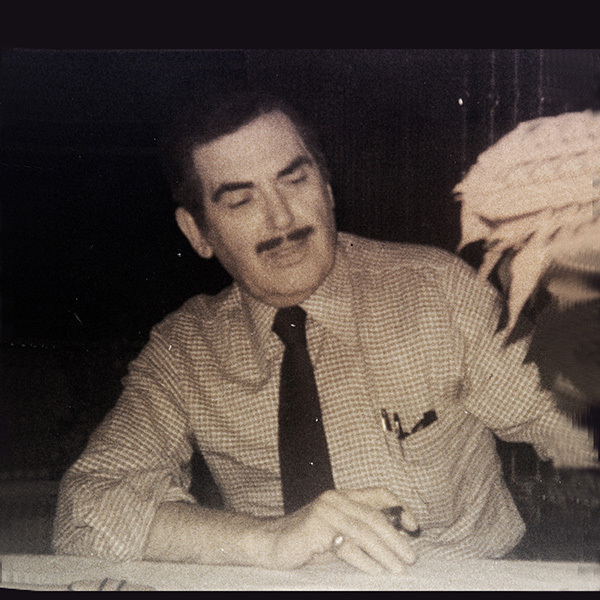 Theodore Arthur Steele was born on April Fool’s Day, 1922 and his creative juices must have been charged with the mischievous and wacky energy that impels that day. 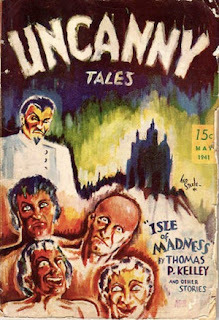 Before beginning in comics, and just after turning 19, he did a cover for the Canadian pulp, Uncanny Tales No. 5 from May, 1941, its first large-sized issue. 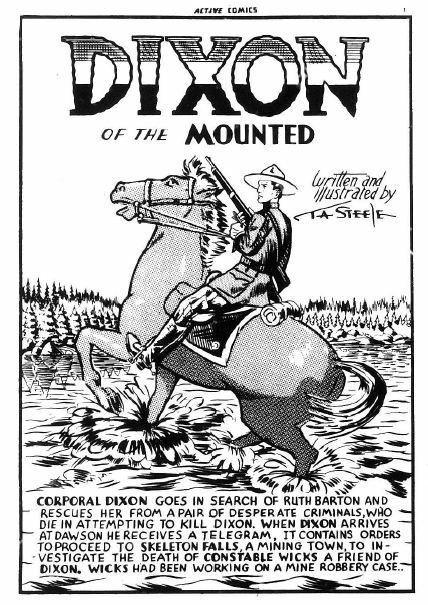 His earliest work for Bell Features was taking over the “Dixon of the Mounted” feature from E. T. Legault in Comics 3 (April, 1942) where he signed the splash “Theodore Steele” and continued with it through to issue No. 8. 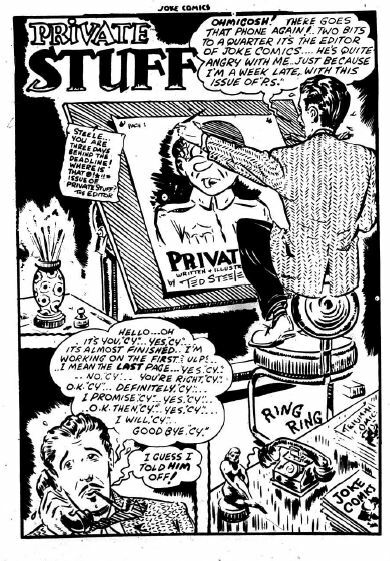 A couple of months later in June, 1942 he produced his first original strips entitled “Pvt. Stuff” in Joke Comics No. 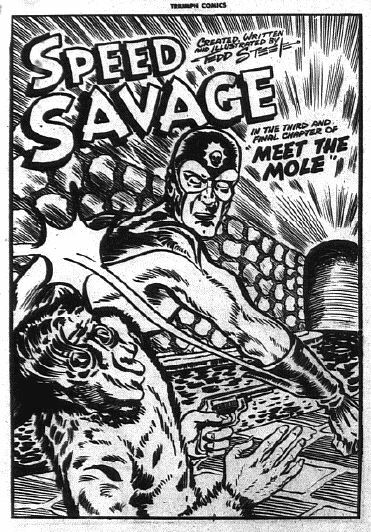 1 as a simple two-pager and, perhaps most significantly, “Speed Savage” in the first Bell Features Triumph Comics No. 7. A couple of years later Ted Steele pulled another pair of original strips out of his hat and these were “Woody and The Wolf” where a comic book artist decides to stop a mad scientist from growing dinosaurs by dressing up as his comic creation, “The Wolf.” This strip began in Wow Comics No. 23 (around Oct./Nov. 1944) and ran until the last issue of the title No. 30 (around the beginning of 1946). It’s notable because he began signing this strip as Tedd Steele with that second “d” and for the rest of his life always used the two “d”-s in Tedd. He did four covers for Bell Features, a couple of Pvt. Stuff covers for Joke Comics 9 and 10 and also a couple of Speed Savage ones as the “White Mask” through his costume transition in Triumph Comics 14 and 15. 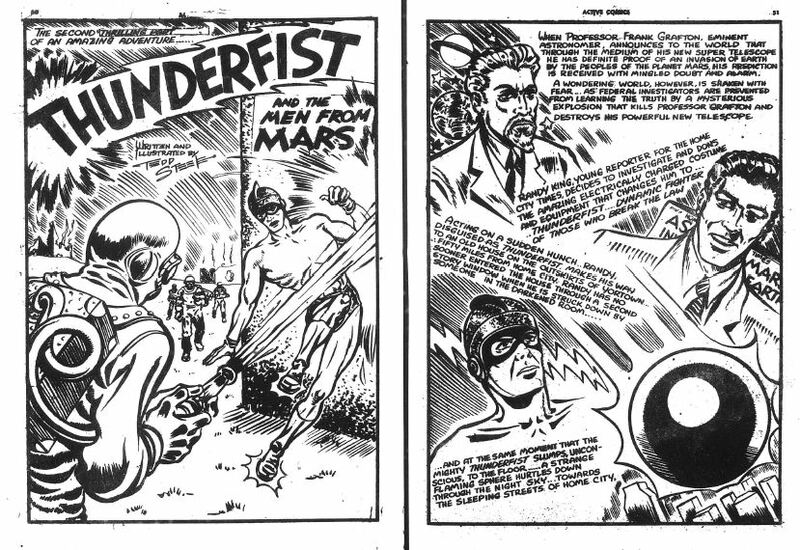 Something notable that we must point out from his later work is the four-part “Thunderfist and the Men from Mars” that closed out that character’s comic book existence in Active Comics 23 (June/July 1945) to 26 (Jan./Feb. 1946). His quirkiness comes from the fact that in his work he never seems to really take himself seriously as a comic book artist and he had a wonderful ability to laugh at himself and the job he was doing. It really looked like he was having fun when he drew a lot of these strips. He sometimes placed himself (along with Leo Bachle, Ross Saakel, and even Cy Bell) directly into his stories such as the “Pvt. Stuff” story in Joke Comics 16 (Nov./Dec. 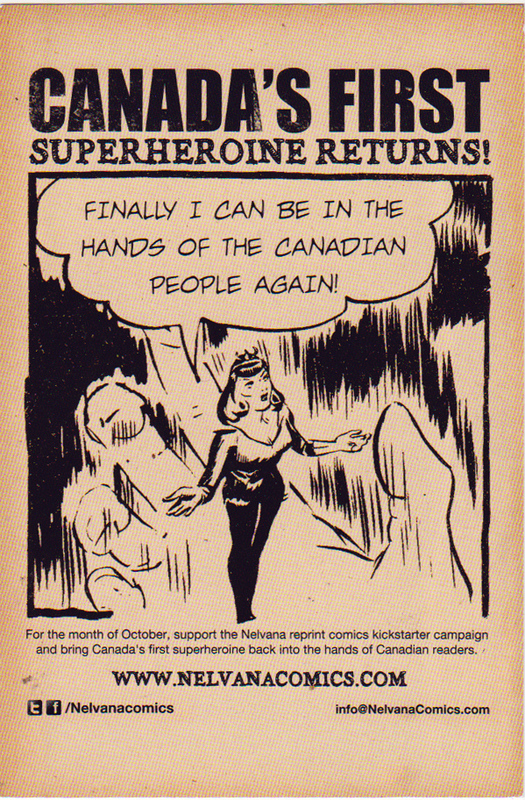 1944) and the “Artists on Ice” story in Active Comics 19 (Oct./Nov. 1944) which developed into “The Panthers” hockey team stories in Active Comics 20 and 21 that also included himself and his Bell Features stable mates. Sometimes he did this indirectly by making the star of the story a comic book artist as he did with his “Woody and the Wolf” feature in Wow Comics. 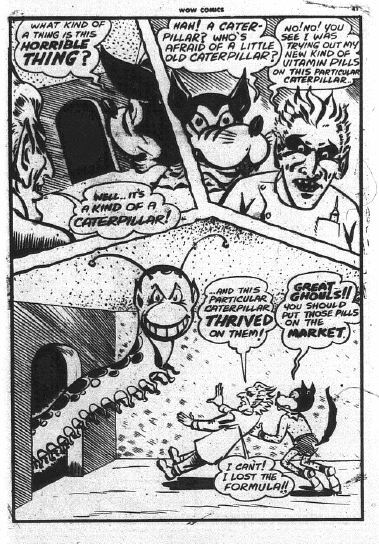 He even produced a full-page cartoon, which was more the specialty of people like Mickey Owens, at the end of Triumph Comics 16 (Oct./Nov. 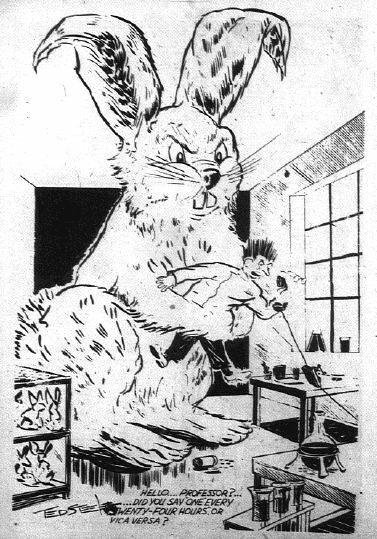 1943?). His quirkiness is also evident in the contest he ran in Triumph Comics 15 where he asked for positive or negative comments on the new “White Mask” costume in his Speed Savage strip and suggestions for the type of story the readers would like to see. This led to the crossover of Capt. Wonder into the Speed Savage strip in Triumph Comics 18 (see my earlier post “Crossovers”). 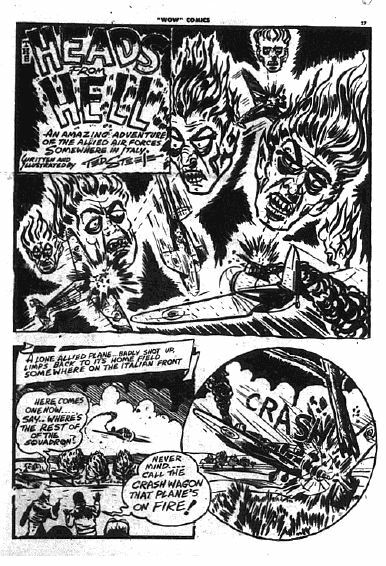 Steele did a few war-themed one-off strips in the later issues of Wow Comics and Triumph Comics and one of these, “Heads from Hell” produced a favourite splash page of mine and really brings Steele’s quirkiness. With a more sinister and supernatural ending, this could have been a classic E.C. story that butted right up to the appearance of the Comics Code. Tedd Steele’s last work for Bell seems to have been his last Speed Savage story in Triumph Comics 31 (June/July 1946?) 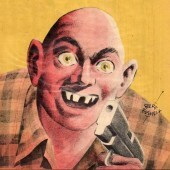 and shortly after, or even concurrently, he began doing freelance writing for Export Publishing Pulps in the form of short fillers for some of their Detective and Western titles. 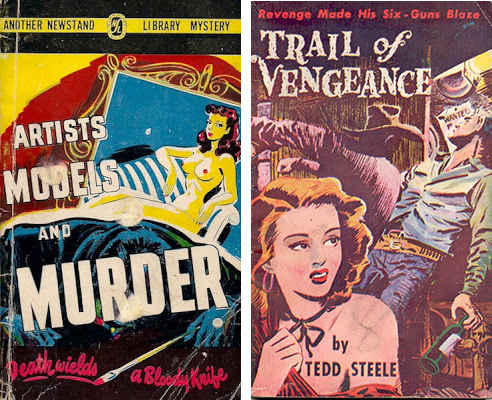 When Export publishing began to produce paperbacks, first for the British market in 1946 and then for Canada in 1948, he submitted freelance novellas and two were published under his own name, Artists, Models and Murder and Trail of Vengeance. 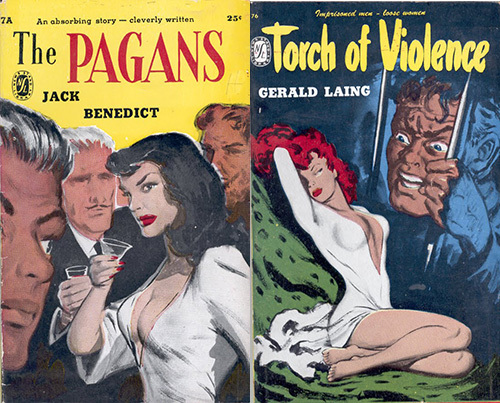 Two others, Pagans and Torch of Violence, he published under pseudonyms such as David or Jack Benedict, David Forrest, or Jack Romaine and they echoed on for years in reprints, sometimes with changed titles. He never did any art for these books. Tedd Steele Paperbacks under psuedonyms. From the mid-fifties to the mid-sixties, Tedd was one of the original “Madmen” doing art and copy for an advertising agency in Toronto and then became a freelance artist and writer for advertising into the 1980s. Tedd Steele was an original and was just as prolific and creative as the major Bell Features artists such as Adrian Dingle, Jerry Lazare, and Leo Bachle who have already been recognized with Shuster Awards. He created one of the iconic characters of the WECA period in Speed Savage/the White Mask and he was quirky. Let’s not wait too long before we recognize him. Speed Savage is my favorite of the ‘whites” charecters. I’ve always thought that the hero name should be Speed Savage with Ted Steele as the charecters civilian name. The name Ted Steele is so perfect for an old fashioned hero. Good comment, Paul, but is it Speed Savage your favourite Bell Features character as Speed or as the “White Mask” and if it’s the “White Mask” is it the Fedora and caped “White Mask” or the tight costumed “White Mask” that appeared with Triumph Comics 15. Or maybe it’s a combination of all three. When I first saw the name “Ted Steele” as a credit in those war-time comics, I thought that it must be a pseudonym since I’d already encountered that surname in E. T. Legault’s first Thunderfist story where one of the Steele twins (Danny) dies and the other (Randy) becomes Thunderfist to seek revenge for his brother’s death. Just noticed in looking over that “Thunderfist and the Men from Mars” series in Active Comics 23 to 26, that Tedd Steele changes the name of the hero from Randy Steele to Randy King. Maybe he wanted to avoid and confusion or association with the lead character’s surname and his own. Tedd Steele seems to epitomize the best of Canadian GA talent, young, full of imagination, yet, like a typical Canadian , not full of himself. He did so much that he clearly seemed to love at such a young age that he must have been an inspiration to both readers and fellow artist that he worked with. The fact that he wrote short stories later that you mention in this article makes me want to find a copy of this rare pulp more now than ever. If anyone has a copy I would love to obtain a copy or at least see the interior. Tedd deserves his place in the Joe Shuster Award Hall of Fame and hopefully this is the year that spotlight gets shined on him. Thanks for the reference to the Victory pulp, Jim. I forgot about this. Jim Brigham sent me a copy of this a couple of months ago and I think I misfiled it. Perhaps another one or two pulp covers from this period by Steele will turn up eventually. As for the Shuster Awards, I think that you’re right but sadly he’s not one of the names being put forward this year. I do think it won’t be long before he gets in. Victory Publishing and Tedd Steele appear to have published at least 3 titles in the spring of 1941. If you’re looking to turn up more about the Canadian pulps you may be interested in the annual pulp show and sale they have at the Lillian H. Smith branch of the Toronto Public Library. This year it’s being held on Saturday, May 11, 2013, 10am to 5pm the address is 239 College Street. The organizers say “The show is a small but pulp specific event, with lots of great stuff for the collector and the curious alike.” I think that their program book from a couple of years ago included a piece from John Hilkert’s unpublished history of pulp magazines from his point of view of actually being a cover artist for some of these. Thanks for the information about the pulp show, Jim. Sounds like an interesting event. I think I might try to make it there for a bit. 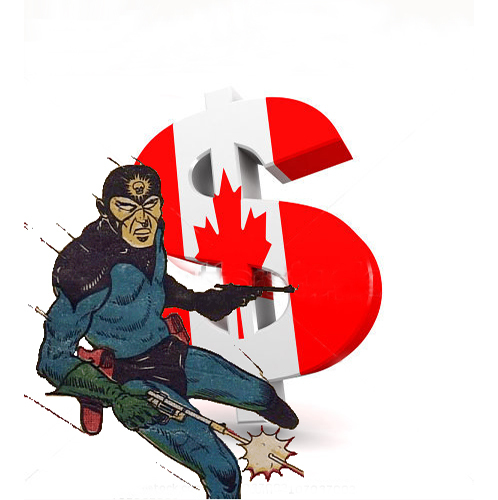 I think that there’s a lot to be uncovered in the connections that exist between the pulps and the war time Canadian comics. 1) I’m guessing that, by now, Ted Steele has long since passed away. Is there any more biographical info on him? 2) Did Steele do anything else with his Wolf Savage character? Good questions, Garret. Tedd Steele passed away twenty years ago. I could find no real biographical information on him other than what I got from talking with his daughter. 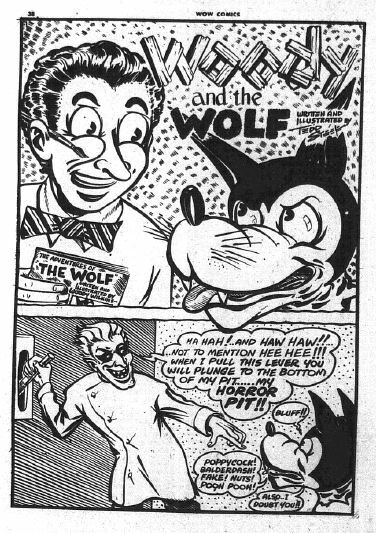 That one issue of the newspaper format Rocket Comics is the only place I’ve ever seen the Wolf Savage character, though he may have an indirect descendant in the form of the Steve Savage’s costumed alter ego, The White Mask.